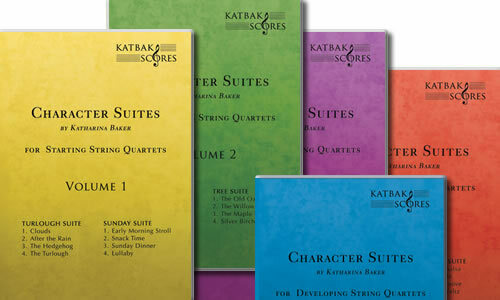 Character Suites is a collection of original string quartet repertoire designed to attract new players to the wonders of chamber music. The 7 volumes address different technical levels, styles and themes. Character Suites have been used by quartets and string orchestras throughout Europe for concerts, competitions and gigs and are becoming increasingly popular. You can listen to recordings of all movements on this website which has become an effective tool for players learning their parts as well as for teachers choosing material for their groups. While most pieces require little technique, they invite for imagination and musical shaping and are enjoyable and entertaining to play and listen to. As you can see, our scores have now become digitalised for download. When you purchase your score, you will receive a link for instant pdf download. However, it is still possible to purchase hard copies of all volumes by email. Please contact info@katbak.com for hard copy purchases. Hard copies of all books cost €25 plus postage.